Chord NOTE, created by Hidenori Matsuoka, is marketed as a “songwriter’s assistant tool”; its primary purpose is to help you create chords to accompany a melody of your own creation. Once you input the notes of your melody onto the miniature piano keyboard provided, the app can provide you with either chords or keys that contain the notes of your next big hit. If you didn’t understand most of what you just read, then this app is not for you. Chord NOTE is not for music beginners – it utilizes terminology and images that requires some musical background to understand. For example, the average app user won’t exactly know what Cm7 stands for (it’s an abbreviation for the chord made up of the notes C, E-flat, G, and B-flat, or a C minor seventh). The page for “keys” also shows a treble-clef staff where you can see each scale written out with its appropriate key signature. 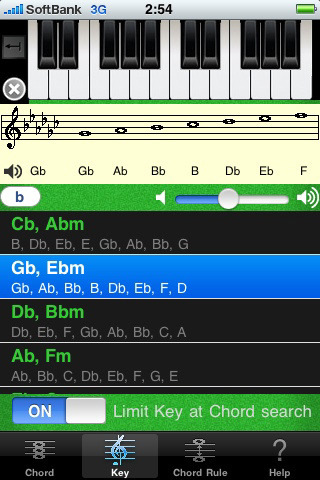 That said, if you do know your stuff, then Chord NOTE can serve as a way to help you review your scales and chords. There’s also a function to limit which chords show up when you input notes – you can have only triads (spelled incorrectly as “triards,” probably as a result of translation issues), both triads and seventh chords, or substitute chords. The last option is useful once you’ve chosen a key to be in – the app will then provide you with chords that are less traditionally used (such as flat third chords), which you can further pick from by inputting notes on the keyboard. Part of the reason why the app does little to help beginners learn is its steep learning curve. For fun, you can click random chords to hear them played back for you, but you won’t see notes that actually make up the chord highlighted on the little piano keyboard above the list. In addition, the notes that Chord NOTE gives you for certain chords and keys are sometimes technically incorrect – the app sometimes uses what are called enharmonic notes, which are the same notes pitch-wise but spelled differently. There’s an option to choose either the flat or sharp accidentals, but this still doesn’t solve all issues. The other reason the app is difficult to use intuitively is the language barrier – many of the instructions are confusing and badly translated. At $2.99, the Chord NOTE is probably not worth purchasing if you’ve either already taken music theory or have never touched a musical instrument in your life. However, if you’re somewhere in the middle of the skill spectrum, the app could prove of some use. With all its imperfections, though, you may be better off reading a theory book and learning the old-fashioned way. AppSafari review of Chord NOTE was written by Julie Guan on July 8th, 2010 and categorized under App Store, Music. Page viewed 3984 times, 1 so far today. Need help on using these apps? Please read the Help Page.